Sometimes you choose to go running and then sometimes running chooses you. Sometimes you choose your dreams and then sometimes your dreams choose you. Sometimes you choose your habits and then sometimes your habits choose you. Sometimes you choose to get your steps in and sometimes they choose you. Sometimes on your life journey the ugliest and darkest and saddest moments later produce the most amazing and beautiful things in your life. Make today ridiculously amazing and do what you love and love what you do. Happy Monday! TGIM! Fist BUMP! Today is a unique gift. Unwrap it. Enjoy it. Explore it. Play with it. So go out into the world and shine your light brightly for all to see. Coach Matt wants you to have an awesome Monday! 1) Never miss a Monday workout! Once you have decided to never miss a Monday workout it does a couple of things. It helps you kick start off the week right. It gives you momentum to keep going with your workouts and movement thru out the week. You dominated your Monday with healthy food choices and meals, setting the tone for continued healthy eating all week. Your brain permanently stays in “I’m making healthy choices this week” mode. You were incredibly productive on Monday, which makes the rest of your week much less stressful. So stop sucking and start dominating. 3) Also drink a lot of water. I recommend drinking half your body weight in ounces of water. So for example if you weigh 150 pounds – drink 75 ounces of water each day. Today is another totally amazing day to be alive. Today is a gift and I have decided to be excited about the gift of today! It has been said that you are either going forward in life or you are going backwards. I kind of like that general line of thinking. So today I hope you are growing. Today I hope you are getting better at getting your steps in or your yoga practice or in walking or in your favorite exercise of choice. I hope you are improving yourself and growing and moving forward in your life. Maybe you are just becoming more content with where you are or who you are. Maybe you are having more fun or have more inner peace. I hope all of these things for you and more. Today is a great day to be alive. May your burdens be light. May your steps be many. May your friendships be rich and meaningful and may you look on the sunny side of things today. 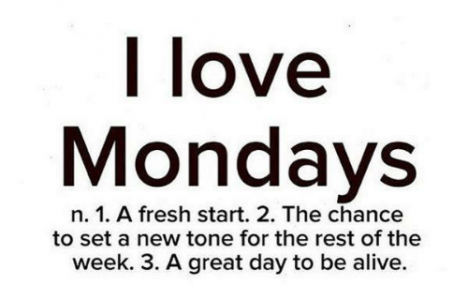 May your Monday be awesome!